For undergraduate/graduate courses in Theories of Development, Child Development, and Lifespan Development. From Locke and Rousseau to Piaget and Bandura, scholars have advanced our understanding of psychological development. In this lively and readable book, Crain introduces the concepts of a number of outstanding theorists, giving special attention to the practical applications of their thought. William Crain is professor of psychology at The City College of New York. A social activist, Dr. Crain served nine years on the Teaneck, NJ, school board and works for student access to higher education and the protection of nature and animals. He and his wife Ellen F. Crain, a pediatrician, have three grown children. A very good book, it was cheap and very useful for my studying. This is a great book for the introduction to the ideas of theories of development. This text also covers theories in the environmental/learning tradition. It can be great for supplementary referencing for any psychology class. This textbook was awesome, it had already been hi-lighted but I actually appreciated that, and the book itself was really interesting, I highly recommend it. As textbooks, I found this one very readable. It was a required text for my ed psych class. It's clear and easy to follow as an introduction to the different theories of developmental psychology. This textbook is for undergraduate/graduate courses in Theories of Development, Child Development, and Lifespan Development. 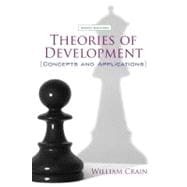 This is a great book for the introduction to the ideas of Theories of Development and William Crain's layout of Theories of Development is an easy to understand format. It's also not as expensive as some of the Human Growth and Development textbooks. I love this book! I will keep it forever!!! Theories of Development: Concepts and Applications: 4.5 out of 5 stars based on 2 user reviews.